These household items were discovered in the demolition rubble of urban terraced properties excavated in the St Paul’s area of Bristol. All the items are made of animal bone (apart from the mother-of-pearl button) and were manufactured in the days before plastic became ubiquitous for many household items. They reflect aspects of domestic life, including lace making, which may have been undertaken as piece-work to supplement the household income. The houses where these objects were found were constructed on open ground during the massive expansion of Bristol’s suburbs in the late 18th or early 19th century. Some of the properties in this area suffered bomb damage during the blitz (WWII) and were cleared during the post-war years, with commercial properties erected in their stead. Parts of the basements or semi-basements survived below ground level and were back-filled with rubble, in which these objects were found. We are indebted to Places for People for funding these investigations before the redevelopment of the area. A full report of the excavations Dove Lane, St Paul’s Bristol Archaeological Evaluation and Excavation Report no 18336 will shortly be available to download from our Reports Online website. This photo shows a tattle shuttle (above) and a bobbin (below). Both relate to lace making. The green staining on the tattle shuttle comes from corrosion of the copper-alloy rivets. In this photo the two perforated bone discs at the top of the photo are the end sections of thread spools used in textile manufacture or textile working, used to keep thread bobbins on a spool. 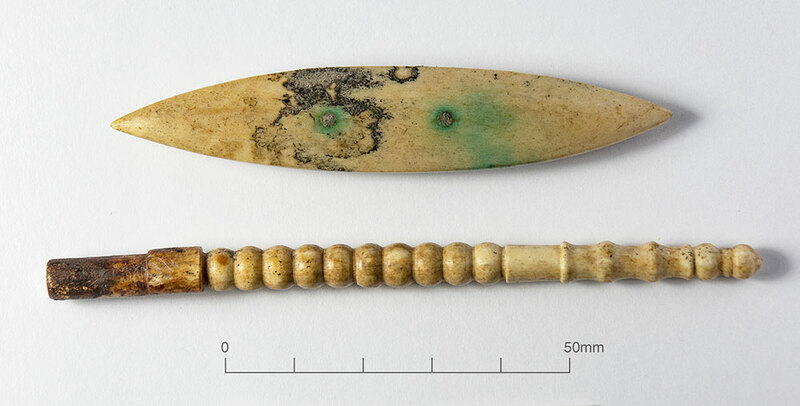 The other two objects are buttons, the one on the left of the photo is bone and the one on the right is of mother of pearl. This photo is of a toothbrush, engraved with ‘Giles, Schacht and Co., Chemists, Clifton’. From historical records dated to 1890 we know that the company was operational in the late 19th century (Richmond et al. 2017*). 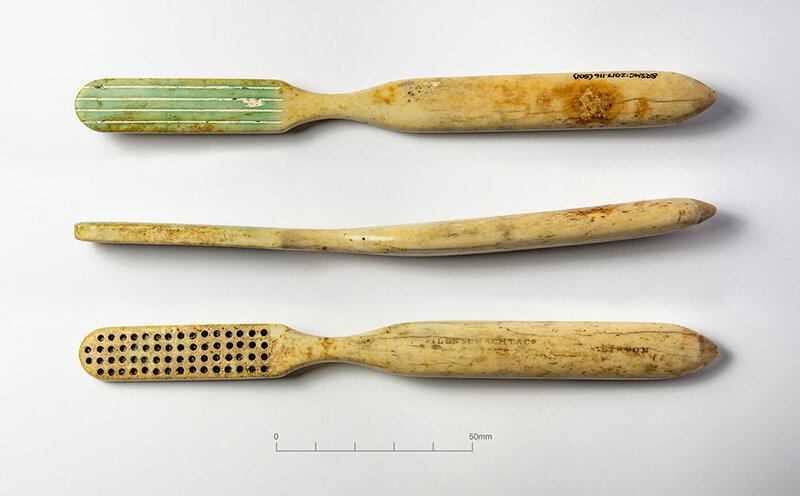 The green staining on the back suggests the bristles were of held in place with copper-alloy wire The bristles were probably of coarse boar’s hair.